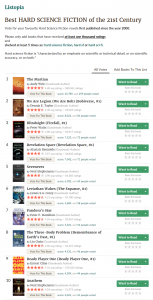 As of today, We Are Legion is #2 on the Goodreads list of Best Hard SF of the 21st Century. I’m unlikely to make headway against The Martian, of course. For We Are Many and All These Worlds are on the list as well, at #20 and #23.